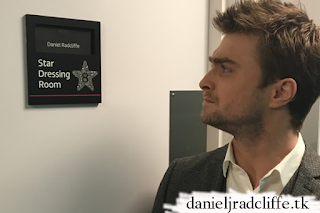 Daniel was filming The Graham Norton Show yesterday and his official Google+ page is updated with a photo. He was there with Joshua McGuire to promote Rosencrantz and Guildenstern are Dead. Other guests are Ricky Gervais, Tom Hiddleston, Ruth Wilson and music from Tinie Tempah. The show airs tomorrow on BBC One, 10:35pm (that's 23:35 for Holland).